Trying to hail a cab at 4pm is the impossible dream. You know it, I know it, and out-of-towners who don't will quickly learn it. You probably know why it's such a futile endeavor -- it's the time cabbies change shifts, handing off the vehicle to their bizarro-cabbie partner -- but you might not know why cabbies insist on doing this turnover right at 4pm, when rush-hour demand is ramping up. I didn't, because when I'm stuck in this predicament, I spend most of my energy cursing the banal charade of life in NYC, and never really bother to think rationally about it. I Quant NY's Ben Wellington did the heavy lifting for me in his latest blog post, where he digs into the infuriating statistic explanation behind NYC's taxi drought. Turns out, the city and the cab companies are both being stupid about this whole thing. Writes Wellington, the reason "cab drivers choose to do a shift change at a time of the day that has some of the highest demand and thus the highest potential for income" is "sort of strange." A taxi is usually shared by two cabbies, each taking 12-hour shifts, he explains, and in an effort to be fair about fares, they've found that switching at 4pm yields them both roughly equal pay. That seems legit, but when Wellington used Freedom-of-Information'd data to find out if it was, he found that there was a more fair time for cabbies to switch: 5:08pm, deeper into rush hour. Well, that's... not good, right? But wait! What if, like Uber's surge pricing, we just incentivize the cabbies to stay on the road during that time? City Hall already tried that. "Under the Bloomberg Administration," explains Wellington, "the city tried to combat this by adding a rush hour surcharge ... they raised the fare from 4PM-8PM by $1." The result actually made the problem worse -- the surcharge-adjusted data pushes the optimal shift-change time even later, to 5:22pm. So basically, it's harder to hail a cab deeper into rush hour, and it will cost more. Wellington has solutions, though. He's got the goods! His proposals include reversing the surcharge to move the shift-change sweet spot out of rush-hour, or incentivizing the garages that rent the cabs to offer their vehicles at a sliding rate to drivers. He came by these suggestions by looking at the data, which he laments is only available by filing an FOIA request. In other words, no one can solve this problem because no one is looking at the numbers. Cabbies can't be expected to take such a step on their own. 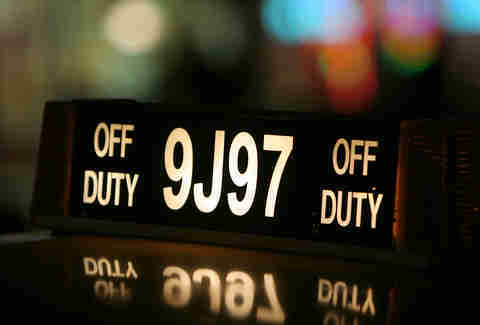 Cab companies won't bother to change unless they're forced. The city, with its well-intentioned surcharge, kinda bungled the whole thing even more. If the data was open, Wellington argues, "a data driven approach like this" could & would be explored by the TLC. Until that happens, though, we'll all just suffer through this banal New York charade. Everyone is stupid. Dave Infante is a senior writer at Thrillist. Follow @dinfontay on Twitter, Instagram, and Snapchat.